InLoox PM 8 for Outlook helps you speeding up your project communication. The email templates allow you to insert pre-defined and project-related information into a new email. You can add new email templates as well as modify the default templates in the InLoox PM 8 options. Select a project in the quick access panel. Add the selected template by clicking Insert. The text template will be added to your email and the project manager of the selected project will be inserted to the email recipients. 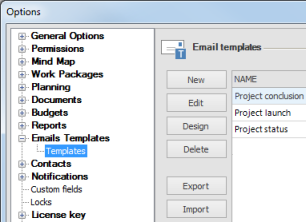 You can create, rename or delete email templates in the InLoox PM options. Under Email Templates click Templates. On the right side you will see the Email templates area. Enter a name in the Template Name field. Define the email field rules such as Recipient, CC Recipient, BCC Recipient and Subject. Click Fields and choose from the drop-down list the field you want, e.g. <PROJECT_MANAGER_0>. Change the saved template by clicking Edit. In the Edit Email Template dialog box, you can make your changes (see the first point). Customize the template content for a report with the InLoox PM email designer. Choose a template from the list and click Design. For instructions on how to work with the InLoox PM report designer, see Work with the report designer and the help documentation of the designer. Remove a template permanently from InLoox PM. Choose a template from the list and click Delete. Load a template from your local data. Click Import and choose a template in the Open Email Template dialog box, then click Open. Save a template in your local data if you want to send it to other users. Click Export and choose a storage location in the Save Email Template dialog box, where you want to save it. Click Save. How to customize email templates in InLoox PM 8 • Copyright 1999-2019 © InLoox, Inc. All rights reserved.